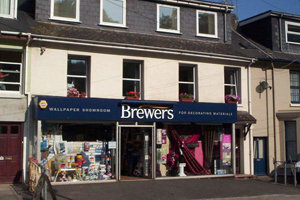 Our Brixham branch has been providing the painter decorators and homeowners of this corner of south Devon with paints and painting equipment for more than 50 years. We became part of the Brewers family in 2002, after almost 40 years as TDS. As well as a good range of paints for all purposes, we carry all the decorating accessories and tools you might need. If it isn’t in stock, we can usually source it within the week. Our small team has more than 70 years’ decorating knowledge; please feel free to ask us anything or stop and have a chat – we’re a community-spirited group! We have dedicated off-road parking directly in front of the shop, which you’ll see on your left as you approach the town centre along the A3022 New Road. We’re just before the bend and the traffic lights. And if you need to bring your children, they’ll be perfectly happy in our kids’ area while you look through our extensive range.